Thursday is the first session of the 2012 Great American Beer Festival. Does anyone out there know why the GABF waits until Thursday to publish the actual beers at the festival? I saw that the Colorado Beer Girl asked the same question on GABF: Why do you make us wait until the day OF for the beer list?! 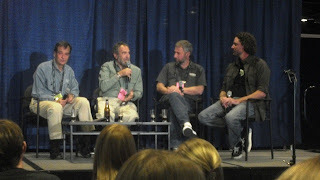 One of the comments on the blog mention that there is a partial list at http://thefullpint.com/tag/gabf-2012-roundup/ This is nice, but I still don't know why the GABF makes us wait. For some reason, the past few Mondays, someone has asked me how the Great American Beer Fest went. It is much later this year than it has been the past couple years, but still it seems odd that Denver area people are that confused as to when the GABF is. Watch. Next Monday, no one will ask me. Denver Beer Fest did start Friday and runs through GABF Saturday. Maybe that was the confusion today. If you are in Denver and don't get to go to GABF, follow that link and see what events you can take part in. Last Friday, I tweeted out "Any brewery suggestions from mid-West or East coast I should try?" I didn't get any tweet responses (probably because I forgot to tag it #GABF), but my tweet ended up on Facebook and some of my virtual friends gave me suggestions there. Sun King Brewing Company ... E35 (of course, I had already planned to visit them). I appreciate the suggestions, and will be sure to hit them all. Let me know if you have suggestions too. Leave a comment below! I got a message from @PushEject (of Heretic Brewing and the Brewing Network fame) today, asking for permission to use one of the pictures from this blog. It was from 2011 #GABF Session 1. Of course I gave my permission. Not sure where or how, but he is using it for The Brewing Network. I feel honored that he asked. Maybe 'cause they don't know, themselves, exactly which beers will be available until everyone gets there and gets set up. Have you been to new Glarius? I would put it on my calendar to ask you on Monday how the GABF was, but I suspect I won't have to wait that long to know how it was...would you like me to ask you anyway? No, they know. Or at least they know what the brewers say they are bringing ... the beers that are listed in the big magazine-like program that gets passed out at the festival. I have not been to New Glarus, but I have been to their booth at GABF several times. No, I don't need you to ask me how it was. I do not care if people ask me how it was ... it just annoys me that people ask how it was before it takes place. Actually, it is just local Denver people who bug me when they think it was 4 weekends ago or 3 or 2 or this past weekend.